Discover step by step how our poultry is raised with love and care, as always with the utmost respect for the original savoir-faire, to bring you this delicate meat and this unique flavour, an unequalled gourmet quality. Our secret? 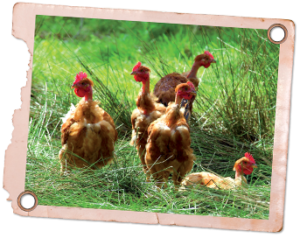 A traditional breed of slow-growing poultry, perfectly adapted to the Landes environment. Our free range Label Rouge poultry colloquially known as the “bare-necked” breed grows twice as slowly as a standard bird. Perfectly adapted to the Landes climate, the “bare-neck” can be identified by its light plumage, its thin skin and its delicate and tender meat. This breed is protected in our breeding selection centre, SASSO, which is situated in Sabres, in the heart of the Landes.